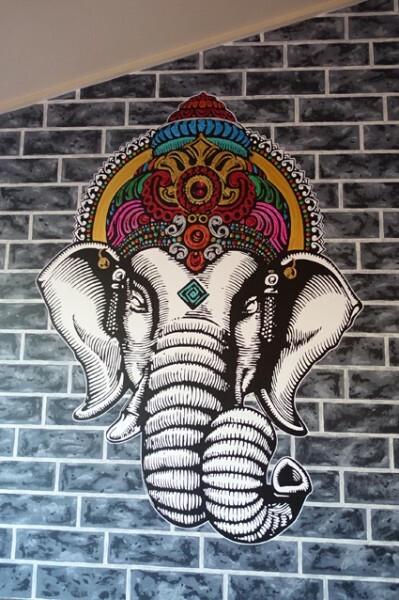 Review - Urban Tadka - Does My Bomb Look Big In This? A battalion of apron-clad staff stands at attention along one wall. They descend the second your glass becomes empty. 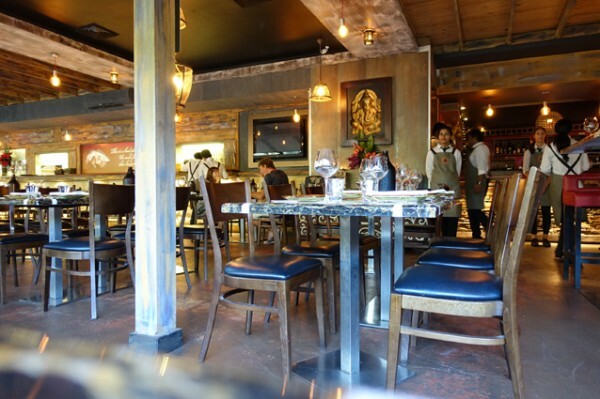 While it might have felt over-zealous had it lasted all night, Urban Tadka quickly fills up to accommodate 240 diners, and the eager floor team are soon occupied moving rapidly between dining room and frosted kitchen windows. On this busy Saturday evening, even the raised function area is employed as overflow seating; it’s quite an amazing enterprise to observe as a first time visitor. 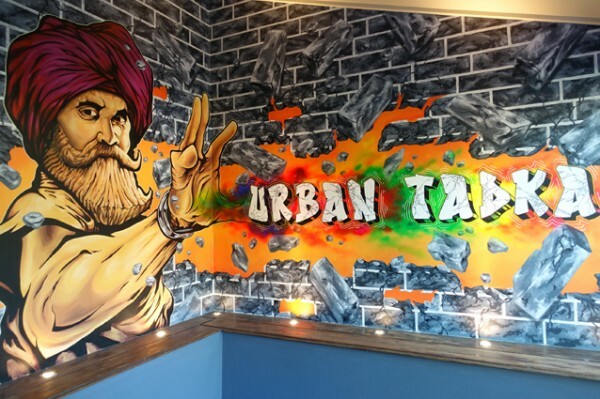 Urban Tadka is the brainchild of Dimpy Singh, Inder Dua and Mandeep Rana. 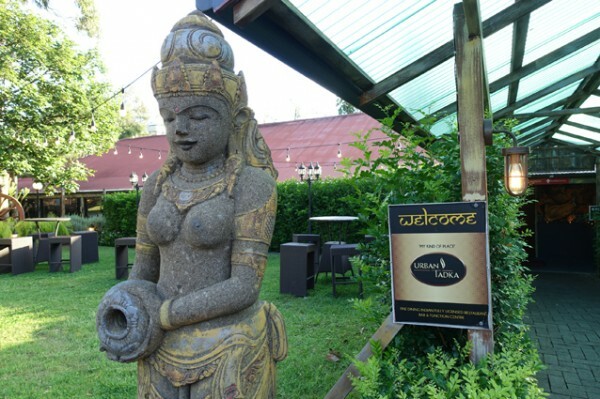 After fifteen years running smaller Indian restaurants that included Magic Curries in Turramurra, and The Thornleigh Curry House in Thornleigh, they wanted a way to distinguish themselves from NSW’s other 1879 Indian restaurants. 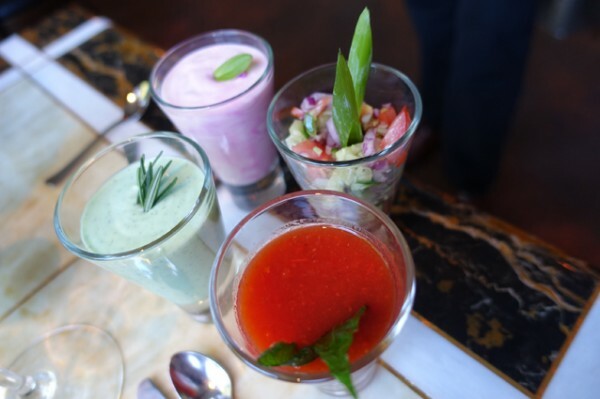 Inspired by upmarket, resort-style dining in New Delhi, they opened Urban Tadka in April 2011. 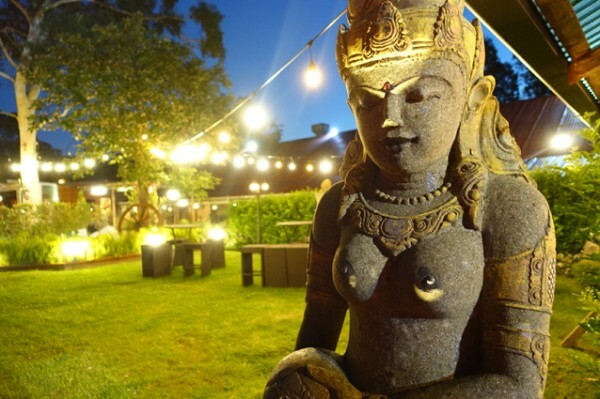 Furnished using the contents of three shipping containers from India, China and Bali, the solid, expansive restaurant, bar and function centre is a curious hybrid of styles. 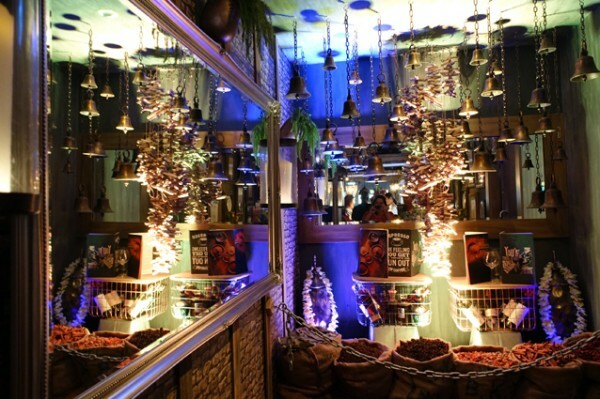 From Balinese sculptures in the entranceway, to turban-clad street-style signage, to an altar decked out with flowers, bags of spices and hanging bells, Singh and Rana clearly aiming for an immersive environment. 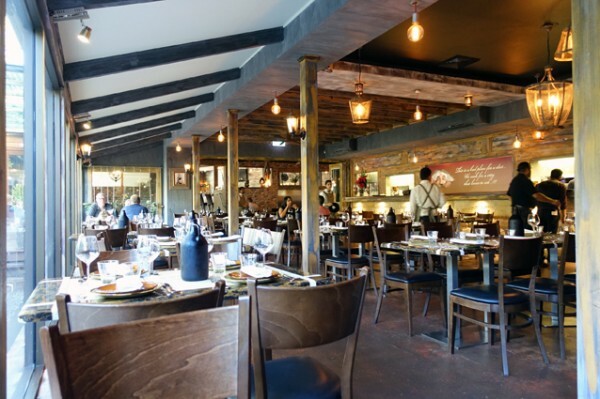 With natural wood tones and large windows that bring in the outside greenery, the dining room itself feels both substantial and tranquil when we arrive for an early dinner. 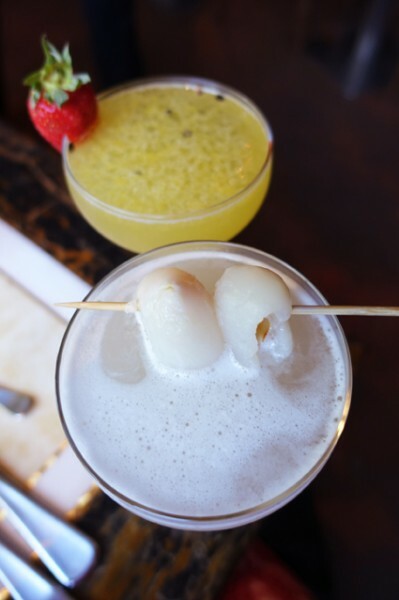 The cocktail list is made up of dependable crowd pleasers, like a tart Passionfruit Margarita ($15) and a slightly too sweet Lichitini ($15) (lychee martini). Beyond the on-tap Kingfisher, the beer list is too mainstream for my taste, which is disappointing because beer and curry are an ideal pairing. 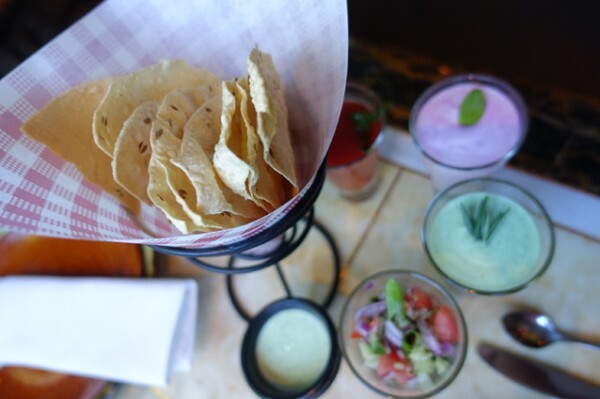 There are some gems to be found in the wine list, which we peruse with a colourful Papadums and Dips Platter ($10.50), won by the pleasantly pink, beetroot raita. Most bottles sit under the fifty dollar mark. 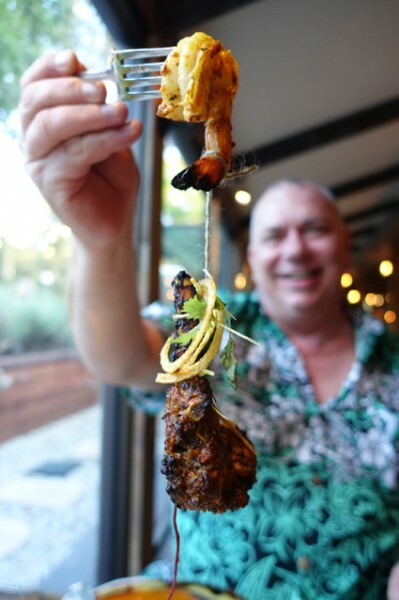 Markups are lower than the CBD, with the Urban Tadka team trying to win-over the BYO-resolute Northern Beaches folk into buying their booze inhouse on Friday and Saturday evenings with the use of some passive-aggressive signage. 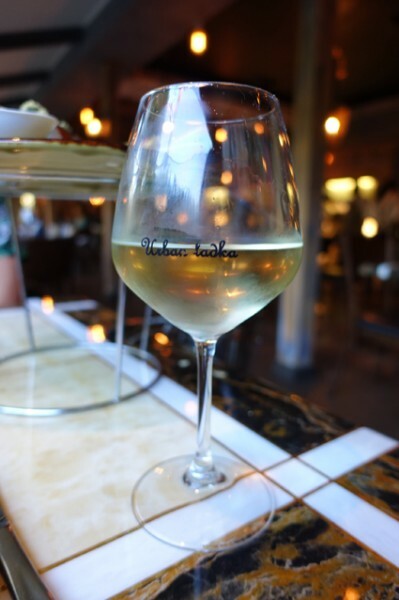 We indulge in the Yabby Lake Chardonnay ($75/bottle), which is very cuisine appropriate with a clean palate throwing lime and citrus blossom. While I sampled widely across both meat and vegetarian platters, your go-to entrée is the Harre Bharre Chaman Ke Tukde ($13.90). These vegetarian croquettes are basically India’s answer to the felafel. They have nice clean spicing, and are presented on sticks with blueberry toppers. 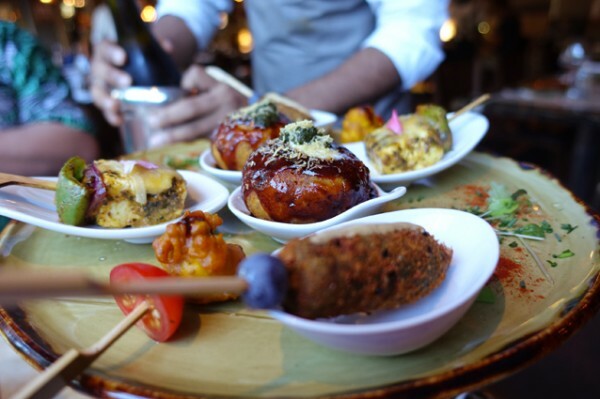 I’m also very taken with Aaloo Ki Chalu Tikki ($13.90) – pan-fried potato patties. The plump potato patties are stuffed with toothsome yellow lentils and have a bold flavour – actually the most flavour I’ve had in a potato patty. The lively spicing is offset by a tart imli (tamarind) drizzle with a crown of mint and coriander chutney and a dusting of thin, deep fried gram flour stands. Even cauliflower florets – Chashme Baddoor Gobhi De Phool ($14.90) – punch above the usual with besan (chickpea) flour and a nice tickle of heat. 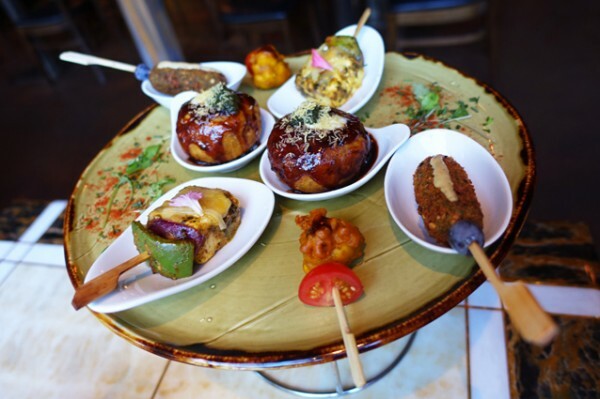 Our scaled down version of The Maharaja Kebab Platter ($90.90/4 people) looked very impressive; covering our Chinese faux inlay table with dishes and condiments. 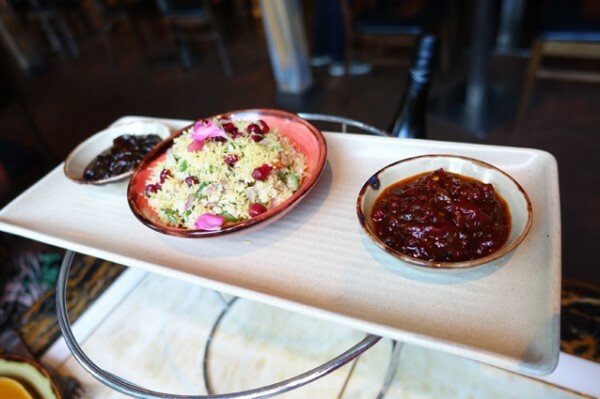 The condiments include an interesting capsicum chutney, and a cous cous and pomegranate salad. 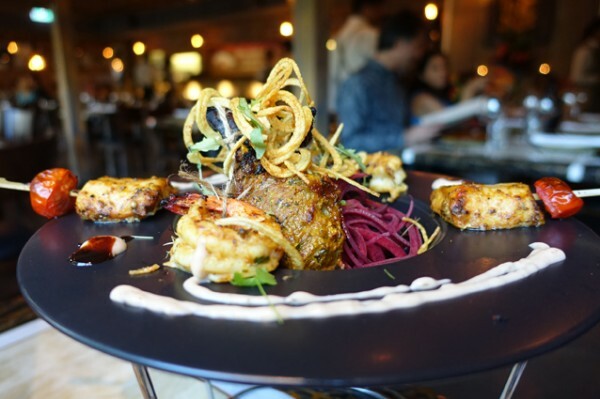 However if you’d like to skip straight to the hits, it’s the Bukni Mirch Ka Malai Tikka ($15.90) where juicy chicken breast fillets are grilled in the tandoor after a rub of garlic, ginger, spices and a dab of fresh cream. 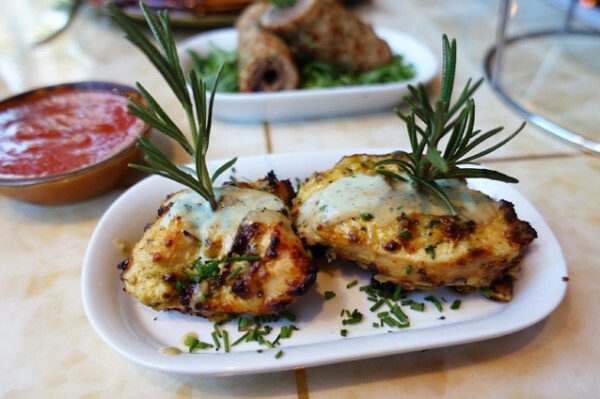 The spicing is clean and aromatic, and the fillet is served speared with fresh rosemary. 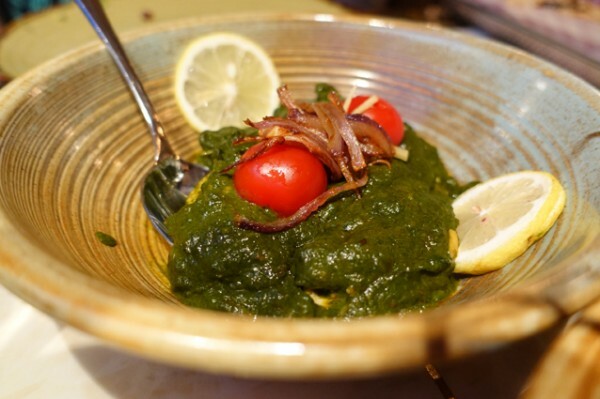 We worked our way through a series of curries, starting with Dhabe Wala Rara ($28.90). 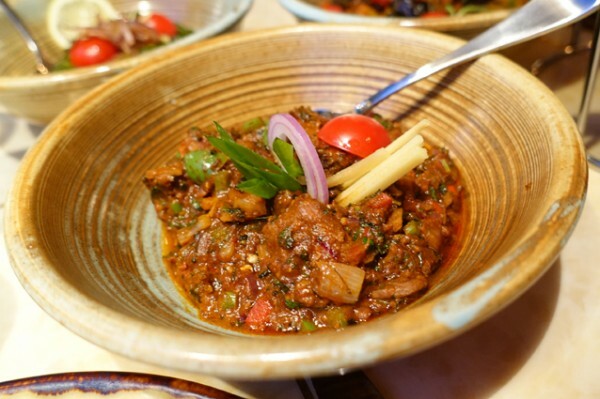 With a hint of North Indian roadside cuisine, this dish is given a five-star hotel makeover with julienned fresh ginger, red chillies, onion, capsicum and hunks of fine-grained, high quality lamb. In complete contrast, Saag Kukad ($25.90) takes tender chicken fillets and unites them with English spinach, fenugreek and garam masala in a compelling green curry that’s almost too big on the savoury, chicken stock-like mid-palate. 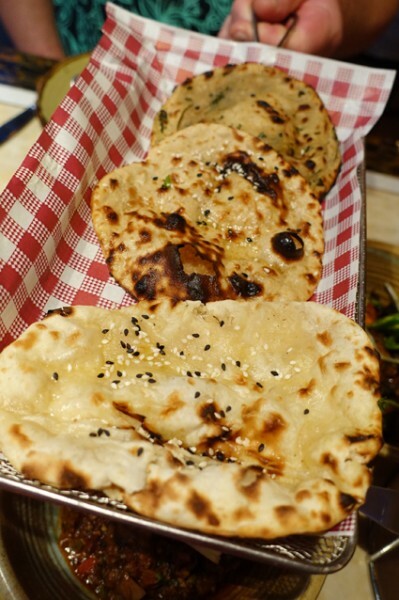 Chugging sparkling water to quench our thirst we persevere, mopping it up with a quality Plain Naan ($3.50). As with the entrees, for me once again, it was the vegetarian main that was the standout. 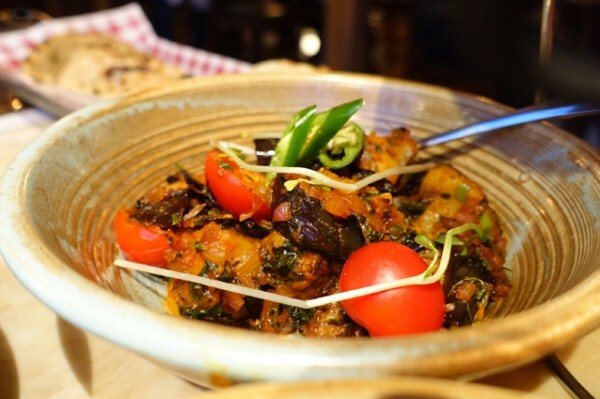 Chatpate Aloo Baingan ($22.90) wok-fries flavoursome potatoes with crisp baby eggplant in tangy masala and makes for very pleasurable eating. 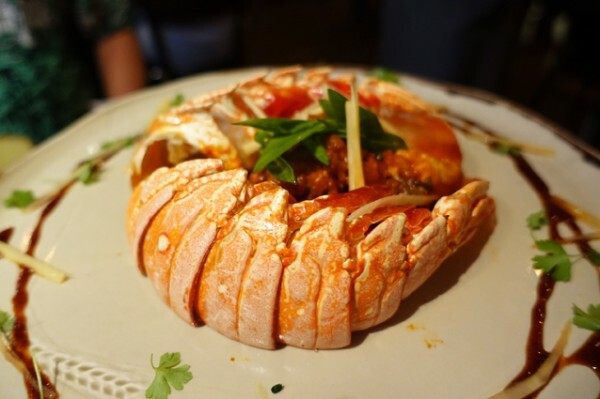 With a five-star hotel-style at the table reveal, the Urban Agari Lobster ($49.90) is certainly an eye-catching, performative way to indulge. 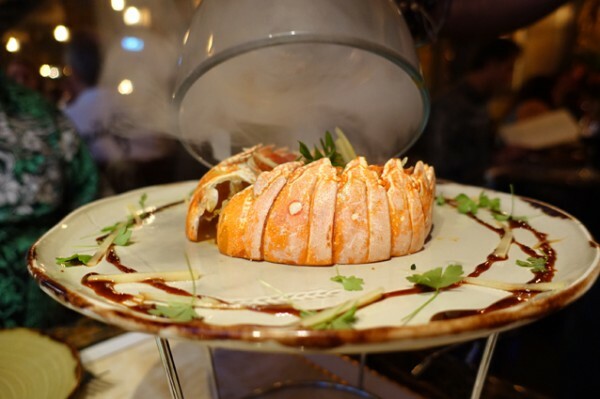 Tucked inside a circlet of carapace and engulfed in a cloud of smoke, you’ll find tender, smoky and spicy chunks of fresh lobster. Fresh matchsticks of ginger are the dish’s defining flavour, reminding me of Chinese cuisine - or at least Chinese cuisine as it’s consumed in India. 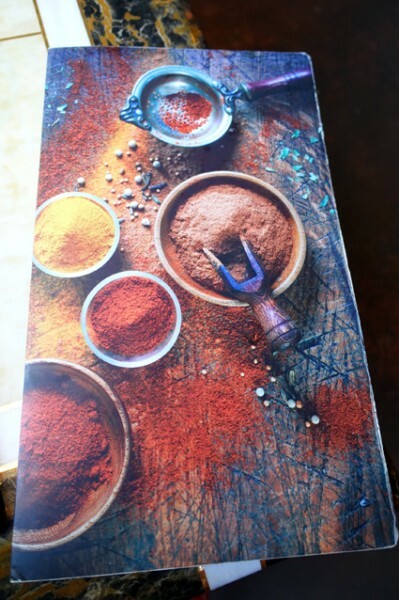 And perhaps in a nutshell, that’s what Urban Tadka has achieved for Indian cuisine. 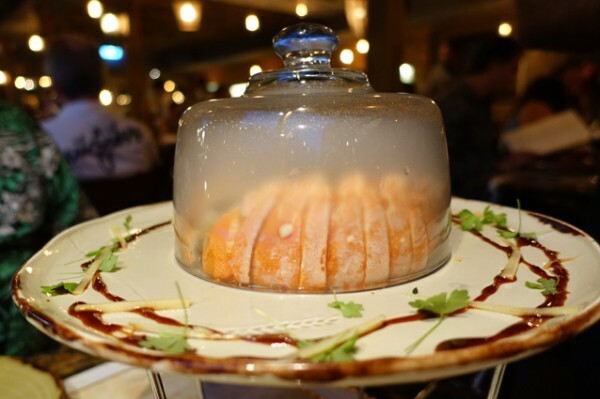 It has taken the appeal of Indian food, elements of more familiar Chinese, and wrapped them up with five-star presentation in a family-friendly environment that caters to all comers. 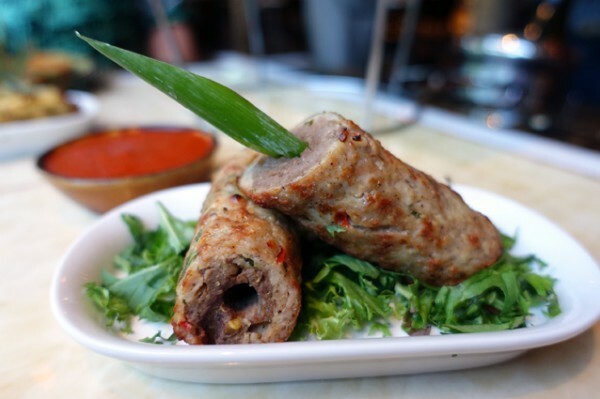 This is tasty food, with a punchy, savoury mid-palate, that’s spicy without being scary, in the type of setting you just won't find in the big smoke.